Dechen Bloom typed out the entire Heart Sutra on a computer, printed it in gray ink, then hand-traced over the words. He did this twice and offered one copy to Ven. Robina Courtin and one copy to Lama Zopa Rinpoche. Photo by Carina Rumrill. April 21, 2014, was a big day for Dechen Bloom, age six. Lama Zopa Rinpoche was visiting Dechen’s hometown of Portland, Oregon, and Dechen had something special to offer Rinpoche. Leading up to Rinpoche’s visit, Dechen had been working very hard to both memorize the Heart Sutra and to write it out, dedicated to Rinpoche’s long life. Dechen bounced with excitement as he waited for Rinpoche to arrive at FPMT International Office. When Rinpoche’s car pulled up, Dechen was out on the sidewalk with his copy of the Heart Sutra. He offered it, smiling, to Rinpoche, who was very pleased. He also recited it on video for Rinpoche the previous day. This offering to Rinpoche had been a couple of years in the making. As Dechen grew from a toddler into a young boy, his mother, Carina Rumrill, had noticed that while Dechen was able to read, count and learn shapes and colors much more quickly than other children his age, his behavior seemed to her to be a lot more difficult. As he reached school age, she took him to be tested by the local school district to see what they thought was going on. They identified him as having ASD (autism spectrum disorder), specifically they told Carina he had Asperger syndrome and sensory processing disorder. Dechen’s a powerhouse! Very much his own boss! As bright as a button, showing multiple talents. 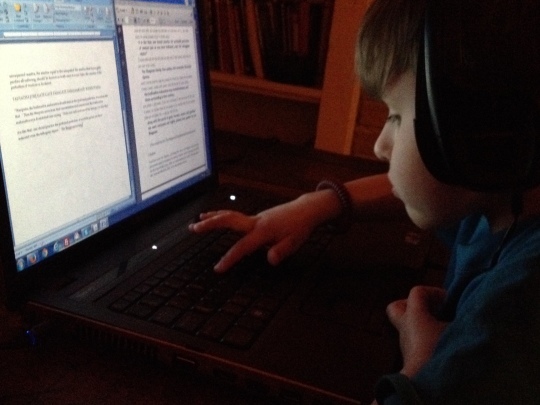 Children like him are often considered by contemporary psychologists as tending towards Asperger’s Syndrome. For me, that’s dangerous. Because there is no factoring in of past karma, a bright, fierce, super-intelligent, super-focused, stubborn child who is also quite mature emotionally can easily be misdiagnosed as having “psychological problems.” After all, “stubbornness,” when it’s used for the practice of morality, etc., is called “enthusiastic perseverance”: We all need that! As Lama Yeshe puts it, “if there’s no energy, there’s nothing to transform!” Give me a wild, stubborn, brilliant person any day! Soon after this, Carina wrote to Lama Zopa Rinpoche, asking for advice about Dechen. Ven. 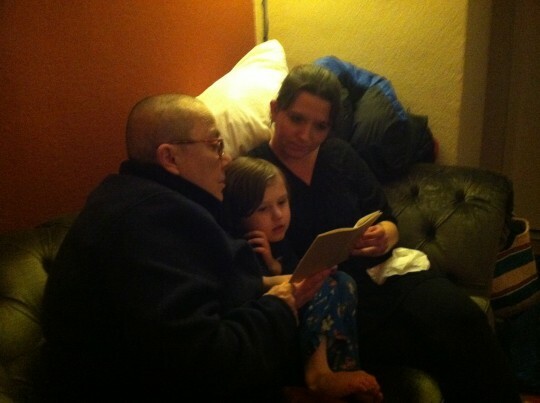 Robina Courtin, Dechen Bloom and Carina Rumrill reading the Heart Sutra, Portland, Oregon. Photo courtesy of Carina Rumrill. After the visit, Dechen exchanged emails with Ven. Robina about the sutra, with Carina serving as messenger. He was five years old at the time. … I told Dechen I was going to tell you he is typing out his second copy of the Heart Sutra for Lama Zopa Rinpoche because you’d be happy to hear that and he wants me to ask you one question. We look forward to your answer! I am happy to hear from you and thrilled to bits that you are typing out for the second time the Heart Sutra. As for your question: as far as I can see, Shariputra asks his question once, not twice. Please point out to me where he asks twice. And remember, his speech is actually the words of the Buddha who is sitting there absorbed in meditation on emptiness and is inspiring the conversation between Shariputra and Avalokiteshvara. As far as “holding those five aggregates also as empty of inherent existence” is concerned, in His Holiness’s commentary on the Heart Sutra the translator has “even” not “also.” His Holiness says that that “implies that a comprehensive list of phenomena will be included in this presentation of emptiness.” And that is what follows: Avalokiteshvara — inspired, remember by Lord Buddha — proceeds to list all the phenomena in the universe divided into the various categories: the six sense powers, etc., the twelve, links, the four noble truths, etc., etc., and that they are all empty of inherent existence. 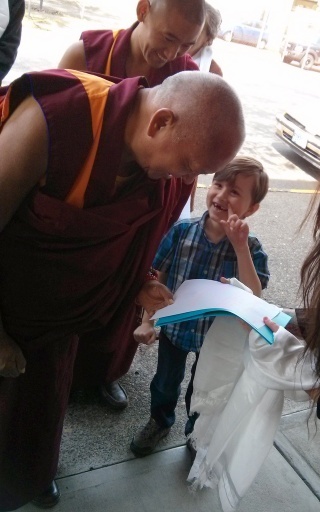 Lama Zopa Rinpoche being offered the hand-traced Heart Sutra by Dechen Bloom, Portland, Oregon, US, April 2014. Photo by Mandala. At the beginning of the Heart Sutra, Avalokiteshvara “beheld those five aggregates also as empty of inherent nature.” So why would Shariputra have to ask him about that again when Avalokiteshvara already told him and the other monks and bodhisattvas about that? If Shariputra was sitting with him, didn’t he already hear him answer that? I didn’t know that the Buddha was having them talk to each other! Why did the Buddha want them to talk to each other about that? Why didn’t the Buddha say it all himself instead? Are Shariputra and Avalokiteshvara both the Buddha!? I think that they are both the Buddha because how else could the Buddha make them talk!? Avalokiteshvara is “beholding” — that is, being aware of — the fact that the five aggregates are empty. He doesn’t actually say this to Shariputra. Shariputra doesn’t ask the question “Are the five aggregates empty?” He asks what should a person do in order to understand “the perfection of wisdom” — that is, understand emptiness. According to His Holiness’s commentary, there are “three principal kinds of scriptures attributed to the Buddha: those words that are actually spoken by the Buddha himself; those words spoken by a bodhisattva or a disciple on behalf of the Buddha; and those words spoken by disciples or bodhisattvas that were directly inspired by the Buddha.” Most of the Heart Sutra is the third kind. Shariputra and Avalokiteshvara are both there too being inspired by the Buddha to say the words they say. According to His Holiness, Avalokiteshvara “appears in the form of a bodhisattva on the tenth bodhisattva level.” Shariputra is one of Buddha’s two principal disciples “and the one among all Buddha’s disciples said to have the clearest understanding of emptiness.” So, he’s not actually a buddha yet, but pretty close. Basically, Buddha is giving this teaching to the all the people but Shariputra and Avalokiteshvara are saying the words. Dechen Bloom typing out Heart Sutra, Portland, Oregon. Photo courtesy of Carina Rumrill. Thank you! Dechen is very happy with this answer! Ven. Robina, how did they sit in the sky!? Did Geshe Dakpa tell you how they were sitting in the sky!? Oh, that’s easy! As you develop power over the mind you also develop power over the physical world, including the body. The great yogis can not only fly in the sky they can also manifest their minds in different bodies, they can turn themselves into more than one person — a dog here, a human being there — in order to benefit sentient beings. By the time you’re a Buddha you can turn yourself into countless beings all the time. That’s the Buddha’s job. To benefit as many sentient beings as possible. To find Ven. Robina Courtin online, visit robinacourtin.com. You can read more about Dechen offering his hand-traced copy of the Heart Sutra to Lama Zopa Rinpoche in the print edition of Mandala July-September 2014.